What is the future for the African Penguin? Now penguins are fantastic birds, full of character, and we are fortunate to live next to one of the most northerly nesting sites of the African Penguin (sometimes commonly called Jackass Penguins because of the distinctive call that only their mother could love). It is therefore unfortunate that we are possibly seeing the last of them. 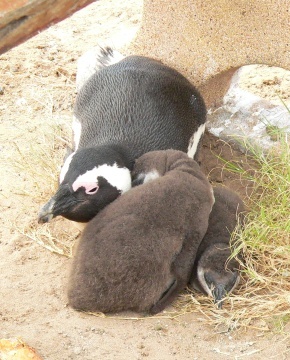 They are surviving at Boulders Beach, however, declining fish stocks, pollution, poor breeding seasons, predation and encrouchment on breeding habitat have put the African Penguin into a possible terminal decline. Protecting sites like Boulders is very important for the survival of these birds in the wild. However, without a clear, workable and sustainable plan to protect fisheries it seems like a grim future for the African Penguin. You can do your bit by first, supporting the colony at Boulders (visit it ones in a while, the animals will love it if you do). More importantly, there is an attempt being made to promote responsible fishing practices. The fishing industry and government has introduced the South African Sustainable Seafood Initiative (SASSI). In an attempt to inform consumers about the fish they are thinking of buying, the initiative puts species of into one of three categories according to whether it is from a sustainable stock or not. It works on a traffic light system- a red fish are from a stock that is collapsing, or is on the brink of extinction- some will be indicated as being illegal in South Africa; orange indicates that a fish is highly vulnerable to current fishing practices or places other pressures on the environment, and consumers should think twice before buying; fish in the green list are most desirable for consumers as they are from stocks that can sustain current levels of fishing. The list changes from time to time as some species come and go for various reasons. You can get more information on SASSI as well as the current list of fish at the Cape Gateway website.